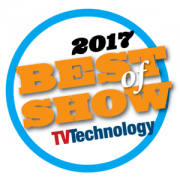 LYNX Technik AG announces its greenMachine® is the recipient of NewBay’s Best of Show Award, presented at the 2017 NAB Show by TV Technology. greenMachine titan, LYNX Technik’s second hardware platform for the greenMachine solution was honored with the Best of Show award. Titan is a four-channel hardware device that complements the existing greenMachine callisto, a two-channel signal processing hardware appliance. Titan simultaneously processes four 3G/HD/SD-SDI video streams or a single 4K/UHD video input. It offers up to 12G processing support (3840 x 2160 @60 Hz) and also provides the functionality to convert between single-link 4K video (12G) and quad-link 4K video (4x3G). Full functionality of the greenMachine titan is designed and built by the user stringing together APPs from the LYNX greenStore®. APPs are modular and function-specific and can be mixed and matched to reconfigure greenMachine to suit virtually any application. As new APPs will be constantly added to the greenStore, this enables the hardware investment to be easily adapted into new applications as required… making greenMachine truly future-proof.